Vietnam entry visa is required for all foreigners wishing to visit Vietnam except citizens of countries having visa exemption inclusion in bilateral consular agreements with Vietnam. Obtaining a Vietnam Visa is the first thing to do when you plan to visit or spend your holiday in Vietnam. We recommend that you obtain your entry visa by having a valid passport stamped prior to your departure by applying to any one of the Vietnam Embassies and/or Consulates worldwide. However, if your particular city does not have a Vietnamese embassy , and you wish to avoid procedural delays ( 4 to 10 days) , we can make this requirement a fairly easy exercise. You can submit information directly on our website or download word document, fill out and return to us with the required information by fax or email. We will then arrange to obtain the Vietnam visa approval code or visa approval letter for you just from 4 hour. VietnamVisa.Pro is built to provide you updated information on obtaining a Vietnam visa. We can suggest how to get a visa to Vietnam in a simple, fast, and reliable, but inexpensive way. If you want to ask how to get a Vietnam visa in your case, you can email us at sales@vietnamvisa.pro . We will reply to you within 1 or 2 business hours after receiving your email. 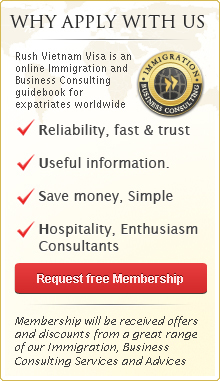 VietnamVisa Pro Company is a local business. We know our Vietnam culture, we know our laws, and of course we know the regulations for Vietnam visas. With our ten years experience in arranging Vietnam visas, we will advise you exactly what the “do’s and don’ts” are on getting a Vietnam visa. In conclusion, VietnamVisa.Pro is built for suggesting you how might best obtain a Vietnam visa. Please try us, then rethink Vietnam and tell your friends that Vietnam is open and welcome to all of you.